Comments: I have had my Horse Pal since May 2002. I can't express my fortune enough for stumbling on this awsome product. 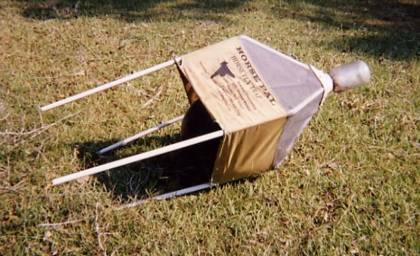 We still, and always will, have horse flies in southern Louisiana, but the sheer number has been reduced greatly. Some are so big I am surprised they can get into the jar funnel. My country property is in Beauregard Parish, La. 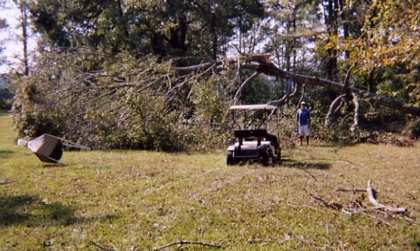 and was hit very hard by Hurricane Rita. We were fortunate to have a home in Dallas, Tx., so we were not evacuees. My La. home was severely damaged, but repairable. Your product fought Rita back as hard as it could. I am mailing some photos that might "blow you away". 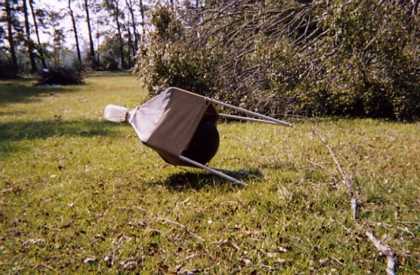 The trap held its ground by the single stake and was blown nearly horizontal with the ground. The frame got bent and some small bits of tree debris blew through the canvas and screen. What a tough product! I am not sure if my insurance will replace my injured "Pal", but even so, I will be ordering another (actually two) when all the dust has settled. Once again, you have a great product. Don't change a thing.